Anon comments are off as of today because of spamming. I tried to be nice and give someone who I noticed on here a chance to say something to me. They didn't. It's been a week.. anon comments are officially turned back off. Running through the grocery store the other day, I decided to give this stuff a try since I had a coupon in my purse... figuring the $2 off coupon would make it practically free. HA!! at $4.59 a carton it took a chunk off, but was it worth it? No, not really. it was Okay. I don't see myself buying it again. Not too many ingredients, but then again.. nothing that makes is special and at 150 cal for 1 cup not really worth that in my book. Who drinks just 8oz of coffee anyway? Surely not me with my gigantic 20 oz coffee mug and 24oz cold cup I carry around with me. This stuff tastes similar to 7-Eleven iced coffee (which is made from a mix full of odd ingredients) it's got a smooth creamy texture. The flavor was alright but I found it lacking a good coffee flavor and wound up adding a little bit of creamer to it anyway. I'm better off brewing my own stuff.... or better yet checking out some of the cold brew techniques for iced coffee and doing it myself (more on that soon). The last day I posted I got a HUGE surprise... my little nephew decided to come into this world five weeks early! He wasn't due until July 12th so I've been working really hard to finish the blanket that I had just started not expecting him this soon. I went over on Saturday to see him and he's so little. Ok, so y'all know that I made the sugar free marshmallows on Saturday (and I'll be making another batch tonight...more on that in a few). I also made a batch of regular marshmallows on Sunday and then yesterday I got an idea in my head... Flavored marshmallows. 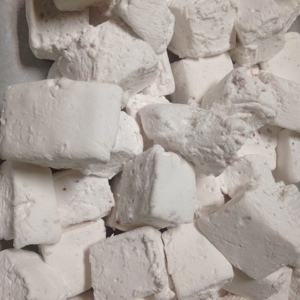 Over the past 3 days I must have made around 200 marshmallows!! 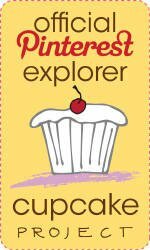 I have a recipe for Cherry almond cupcakes that looks amazing. 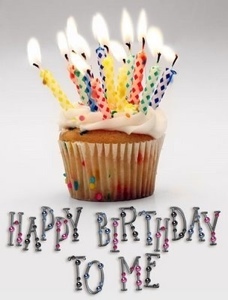 My only problem? I'm allergic to Maraschino cherries (not the cherries, but the sulfates that are used to preserve them) so even though technically I can make them, I wouldn't be able to eat even one so that kind of kills it for me. I started to browse around for recipes for flavored marshmallows and learned that you can use fresh fruit like berries, bananas, and peaches. You can Not use pineapple, kiwi, mango, or guava because of a particular enzyme that breaks down the gelatin so the mallows won't fluff up at all. I also don't like to use food coloring. I try to avoid it as much as possible because I think it adds a weird flavor to the marshmallows and I try to keep things as pure as I can. I make my own Vanilla extract and I'm going to make my own almond extract soon too since that stuff is seriously expensive. I had a thought in my head yesterday and wasn't going to let it go until I got home and did it and I was So happy that I went through with it because even my kid said they were the best marshmallows that he'd ever had! I bought a packet of dried cherries and put about 1/2 cup into my food processor and chopped them really fine. I put the chopped up cherries back into the measuring cup and added 1 tsp of almond extract and just let it sit and steep while I made a batch of regular mallows. 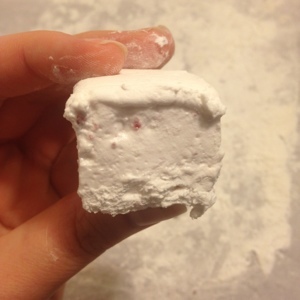 I added the cherries in the last minute or so of whipping up the mallows and they came out a very very pale pink with little bits of cherries in them. Absolute Perfection!! I'm going to make a batch of cherry almond sugar free ones tonight and I'll also let y'all know how those turn out.